Home Lifestyle Home & garden Blue Willow China – a love story? The Willow Pattern – also known as Blue Willow or simply the Blue Pattern – deserves to be recognised as an English design classic. Over the last 250 years it has been painted and printed on countless millions of teacups, saucers, sugarbowls, pots, plates, dishes, you name it. But its star has been in serious decline for half a century or more. When was the last time you saw the Willow Pattern? Probably in a charity shop, or your granny’s kitchen. But it ought to be up there in the spotlight with red phone boxes and Kinneir/Calvert road signs. Instead it’s consigned to unfashionability and neglect. Long ago in ancient China, there was a beautiful girl. She lived with her father in a grand house on an island in the middle of a lake. The girl fell in love with a boy, but her father disapproved of him and wouldn’t let her see him. So one day the boy sailed across the lake in a boat and met the girl in secret in the garden of her house. Suddenly her father spotted them and tried to throw the boy off the island. The two young lovers ran away, chased by the angry father. They fled over a bridge to another island but were cornered in a small summerhouse. In desperation they prayed to the gods for help and, lo and behold!, the gods took pity on their plight, turning the pair into birds so that they could be with each other for eternity. The girl becomes Koong-se; the boy is Chang and he serves her father as his private secretary. The father himself is a powerful and wealthy Mandarin and hopes to betroth poor Koong-se to the aged Duke Ta-jin. Discovering Koong-se’s feelings for a mere secretary, the Mandarin banishes Chang from his service and builds a fence around the island to keep him out. But true love is nothing if not determined and Chang floats a message to his beloved in a small boat, carved from a coconut. That night, during the betrothal feast, Chang creeps into the Mandarin’s palace in disguise. He slips past the guests and the guards and finds Koong-se. Taking her jewels with them in a box, and lighting their way with a lantern, they run out of the house and away to freedom. But at the last minute they’re spotted and the Mandarin (or sometimes the Duke) gives chase, pursuing them over a bridge with a whip in his hand. Luckily, they are younger and fitter, and haven’t eaten or drunk so much at the feast – they make it to Chang’s boat, hidden in the reeds, and sail away to live in bliss in a beautiful pagoda. The Mandarin and Duke Ta-jin never forgot the slight to their prestige and plotted their revenge for years. Their spies finally tracked the happy couple down and prepared to murder Chang, but Koong-se set the pagoda on fire so she and her love would die together. Watching down from heaven, the gods were so moved by their plight that they turned them into doves, the symbol of undying true love. Whichever version you prefer, ever since then people have painted the story on china plates so that no one should ever forget this touching (and occasionally tragic) story of true love. And, of course, if you look at the Blue Pattern, you’ll see all the elements of the story are there. So it must be true, mustn’t it? No! It’s total invention and hogwash. Romantic invention and hogwash granted, but invention and hogwash all the same. The more prosaic truth is that Chinese porcelain (or “china” for short) was big business in 18th century Europe, along with all things Chinese-y. A huge demand for authentic chinoiserie could not at first be sustained across the vast distances involved, nor in the face of China’s travel and trade restrictions. So European potteries came up with their own takes on Chinese culture, loosely copied from genuine pieces. Late Ming and early Qing blue-and-white ware was especially admired but was initially beyond the means of all except the wealthy elite. However, by this time the Industrial Revolution was in full swing and the vast potteries at Worcester and Stafford etc moved quickly to claim their share of the market. China was slow to react, and such was the scale of competition that Chinese factories often struggled to undercut British prices. More humiliating, when particular patterns proved popular in Western markets, the Chinese often found themselves forced to imitate the imitations! – usually (but not exclusively) two birds towards the top. There is indeed something of the real China deep in the DNA of the Willow Pattern – shan sui motifs (“hills and streams”) had been prevalent in Chinese art for centuries and included many similarities. But the Blue Pattern, like the English cuppa, has come a long way from its oriental roots and is now thoroughly naturalised. Yet old habits die hard and, to try to persuade their customers of the “authenticity” of the pattern, British producers invented a “traditional” legend to explain it. – do the figures on the bridge really look like they’re running or chasing anyone? – couldn’t they be carrying rather more mundane items: a lantern, a package, a fishing rod? – would any truly filial Chinese maiden abandon her aged father or go against his wishes? That kind of behaviour would seem distinctly European! But why try to dissect and deconstruct this humble pattern? Why not just enjoy it for what it is? Whole dissertations have been penned on the socio-political insinuations of this mish-mash of east and west. Some suggest that it encodes not a romantic tale of doomed love, but a commentary on British imperial machinations in Hong Kong and China. Others see in the Blue Pattern a steganographic condemnation of the Manchu persecution of Shaolin monks. As for me? We think they’re all trying too hard. 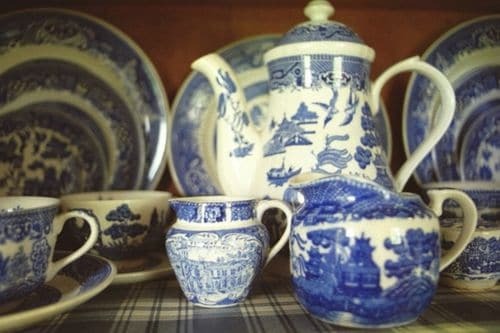 I prefer to see the Blue Pattern as a lovely, if somewhat old-fashioned, backdrop for a cup of tea and a slice of cake. Sure, it’s familiar to the point of disregard, but therein lies its charm. We think it’s time to reclaim the scruffy old Willow Pattern for what it is – a stalwart of British cultural and social history. It’s high time for a revival, a retro-kitsch reboot if you will. We want to see the time-honoured Blue Willow take its rightful place in the pantheon of great designs – let’s see if we can’t do something to help! A Chinese vessel, sailing by. A willow tree, hanging o’er. Built upon the river sands. A crooked fence to end my song. Now doesn’t that feel better already?